Brodie prepares for Richmond rematch Join Media Manager Sarah Allen as Collingwood Media brings you the latest episode of Team Sheet ahead of the club's clash with Richmond in round 20. Levi Greenwood will play his 100th game against Richmond at the MCG on Friday night. They stand 37cm apart, but the tallest and the shortest this week have something in common. At 211cm and 174cm respectively, Mason Cox and Jarryd Blair have both been named in a Collingwood side set to take on Richmond on a Friday night at the MCG. The pair replace Darcy Moore and Jordan De Goey in the senior side. Round 19 Rising Star nominee Moore failed to overcome a hamstring complaint sustained before half time in his breakout game. VIDEO: Hear from Brodie Grundy ahead of Collingwood's Friday night encounter with Richmond. The 20-year-old forward had eight disposals, took six marks and kicked 3.2 in just 34 per cent playing time against West Coast. Yet on Thursday Collingwood director of football Neil Balme said he hadn’t been given the all-clear to retain his place in the side. 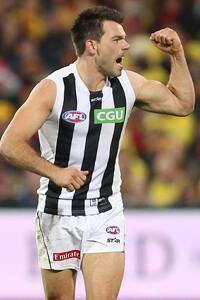 “It’s not too bad,” Balme told Collingwood Media. The football department boss also described the selection of Blair as a “no brainer” after a week off with a groin complaint. The small forward has been named on the interchange bench, alongside milestone man Levi Greenwood. Greenwood, 27, this week reaches his 100th game after almost nine years in the AFL system. After playing 74 games for North Melbourne, the product of Port Adelaide in the SANFL has played 16 of 17 games for the Magpies in 2016. He had 21 disposals against Richmond in round two in a game remembered for six goals to Alex Fasolo and the late-game heroics of Brodie Grundy. Neither team has experienced large amounts of success in the time since, with both the Magpies and Tigers out of finals calculations with four rounds remaining in the home and away season. Collingwood was impressive in a 19-point win over West Coast last weekend, while Richmond have been the focus of media scrutiny throughout the week after being smashed by Greater Western Sydney in Canberra last Saturday.